Raffaello Sanzio da Urbino or Raphael was a renowned architect and painter of the High Renaissance period. He is placed among the trinity of master painters of the period along with Leonardo da Vinci and Michelangelo. Most of his works are preserved even now and in his short life of thirty seven  years he has produced some great masterpieces. The School of Athens, Transfiguration, St. Michael, St. Michael Vanquishing Satan, Ezekiel’s Vision and many other paintings have become inspiration for centuries to painters, art lovers and even general observers. St. Michael and St. Michael Vanquishing Satan are two paintings that resemble each other in themes and show the maturity of Raphael as a painter through a decade of influence during the Renaissance. There is very little information about St. Michael in the Old Testament and the New Testament. However, there is vital information that helps the readers to understand that Michael is not a Saint but an Archangel who is deemed as a Saint because of his place near to God in Heaven. 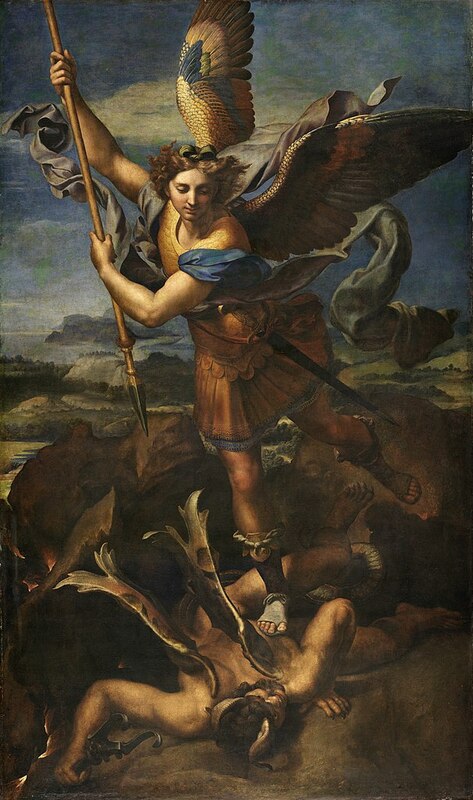 The prime responsibility of Michael the Archangel is to fight Satan and this idea has been reflected by Raphael in his paintings. In the Revelations, there is a mention that St. Michael will fight with a dragon [which is to be understood as Satan] and the painting St. Michael depicts the same. The later painting St. Michael Vanquishing Satan depicts Satan as a fallen angel and St. Michael with a grown human form. St. Michael is a painting by Raphael in which the archangel is portrayed as a young person and is shown to overthrow a demon. The painting was believed to be done during 1504-05 for the Duke of Urbino – Guidobaldo da Montefeltro. This was the time, according to Giorgio Vasari; Raphael was contemplating and absorbing the artistic grandeur of Florence. There is a clear influence of Dante and the Apocalypse as can be found in the Book of Revelation. Dante in his epic, Divine Comedy, explains the nature of punishments to thieves and hypocrites. In the painting, the thieves are devoid of their clothes and are attacked by dark figures resembling snakes and birds. The hypocrites are emerging from the ground in lead cloaks and forced by demons to march towards the burning tower. St. Michael has overthrown the dragon and there are other demons that are surreal. Another demon on the left is shown to suffer like the dragon indicating that the Archangel has fought other demons too. The halo over the head of St. Michael indicates his divinity and power over demonic beings and the shield of Michael resembles a cross and is very prominent in the painting.. In St. Michael Vanquishing Satan there is no such halo and the posture changes too. The dragon tries to attach itself to St. Michael as a defense but the Archangel is depicted with a determined face and a firm stance, meaning that he would not hesitate to slay the dragon. Because of its dimensions the painting by Raphael is sometimes referred to as The Little St. Michael as the other one huge in comparison. While the first painting was done for the Duke of Urbino, the second one was done for Pope Leo X. The painting was done in the year 1518 when he was asked to revisit the theme of St. Michael overwhelming the demon. St. Michael Vanquishing Satan was done during the period of Raphael where he has grown completely as a painter and was creating masterpieces. This version can be said as an authentic version of Raphael because of the removal of all elements that were influenced by the inspirations of the age [Renaissance]. The painting focuses on the Archangel and Satan without much revealing of the background. The standing position is very similar, except in this painting the chest is facing more towards the viewer. St. Michael is depicted with colorful wings, strong masculine features, clad in golden armour and is carrying a spear and a sword. The sword resembles the one the Archangel uses in the former painting. Satan has a tale similar to that of the dragon in the other painting. However, he is shown with a face, horns and scepter. Raphael shows Satan to be a culmination of dragon-like, demon-like and human-like features. There is a speculation that St. Michael Vanquishing Satan was done by Raphael’s associate Giulio Romano. It is because the painting had a lot of dark or gloomy black colour used that was put in contrast to the gold colour on St. Michael. This news was passed on to Michelangelo, a great rival to Raphael. Although, nothing could be proven and nothing was done during the lifetime of Raphael, the painting was restored to deal with these issues. The restoration process took three years from 1537 to 1540 and was done by Francesco Primaticcio. St. Michael and St. Michael Vanquishing Satan are both present at Louvre Museum, Paris. The two paintings represent how Raphael has understood art and grown beyond the influences of the time and became one of the greatest painters of the age. Further, the paintings themselves reflect on the faith of Raphael and his dedication towards religious art.